This is my wife, Michele’s favorite scary movie. I will admit that I usually watch most of this fright fest alone every October, well, my daughter Nicole likes a scary movie or two. I remember when she was about 2 or 3 she used to sit on my recliner chair with me and we would watch the movie Candyman together. Better call child services! She is warped for life! The Creature from the Black Lagoon is a horror classic! It was filmed at an old roadside attraction called Silver Springs in Florida. I remember as a kid we visited this place on a whirlwind vacation through Florida in the ole’ Family Truckster. It was so cool to see the same scenes in the movie in the world famous glass bottom boats. I think the place is closed down now. Dang economy! 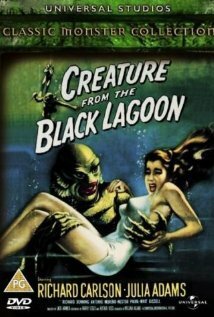 There is said to be a re-make of The Creature from the Black Lagoon in the works but is only in pre-production due to the writers strike in 2007. Bill Paxson (Twister, Titanic, Aliens) is said to star in. We will see but lets not hold our breath (pun intended)! Plot: A scientific expedition searching for fossils along the Amazon River discover a prehistoric Gill-Man in the legendary Black Lagoon. The explorers capture the mysterious creature, but it breaks free. The Gill-Man returns to kidnap the lovely Kay, fiancée of one of the expedition, with whom it has fallen in love.